Paul Bliss from Ennect contacted me today after reading that we use Constant Contact as our newsletter program. Ennect is marketing software, including email marketing, online surveys, event registration and online sweepstakes functionality. And that right there is why most of us don’t try new products. I’ve been using Constant Contact for years and love it. It’s a brilliantly simple way to send emails to our lists, and it’s cheap ($15 US per month for under 500 subscribers). Whilst Ennect might be even better, for many people the time it takes to set up and review the new product just isn’t worth it. So what will get you to sample a new product? A free trial – Ennect do that. Endorsement from a reviewer – Paul mentions “Ann Rincon, editor of about.com gave ennectMail 4.5 our of 5 stars. 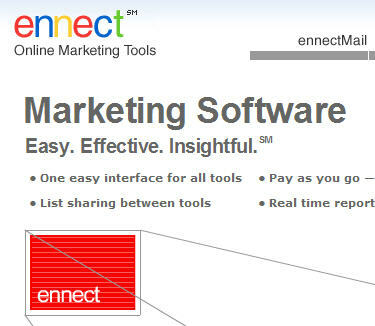 And, our ennect online marketing tools have received kudos from both Cisco and Dell. That endorsement doesn’t thrill me because I’ve never heard of Ann, so that doesn’t carry much credibility. Ennect do a lot right, and their product looks good. But they, like many of us, need to provide a very compelling reason to sample and swap. Do you have a compelling reason for your potential customers to swap to you? As I’m just starting out in this industry, I’ve noticed that a lot of my time is used finding decent products to use for stuff like this, so I’m hearing you there!! Also, I can’t help thinking that even though Cisco and Dell are “big names”, if it was me it would’ve gone a long way if Paul could’ve found a good testimonial from someone in the same or similar line of work to me. I’m guessing you guys at Tailored don’t get bogged down in desktop or network hardware too much, so his kudos from Cisco and Dell means less to you? Thanks for the mention, and I think you brought up some good points in us assuming you would know who these people were, just because we did. Thanks again for the consideration and keep up the great postings.